“I’ve never met a leopard print I didn’t like,” Diana Vreeland once said, and I’ll tell you, me either. I remember the halcyon days of two years ago when the idea of wearing a leopard print coat felt like a bit of a novelty—a sartorial wink-and-nod you could share with fellow lovers of campy things. Now, the print has fully been rediscovered and reevaluated by all corners of the fashion world and wearing it feels almost too ubiquitous. And yet, my eyes light up whenever I see a great leopard-print trouser or this Sandy Liang pullover, or most recently, these Opening Ceremony x Birkenstock slip-ons. It’s a print I never tire of, no matter how many faux-fur coats I see at the bar coat-check. It’s also a visual shortcut to a certain kind of tongue-in-cheek flirtatiousness. The black-and-gold spots aren’t viscerally sexual in the way that, say, red fishnets or a strappy black garter are; it’s more of a tongue-wagging suggestion of fun. There are too many queens of leopard print to count. There’s this tremendous photo of Eartha Kitt, clad in head-to-toe leopard, a leashed cheetah resting alongside her. There’s Norma Desmond and her leopard-upholstered car in Sunset Boulevard. 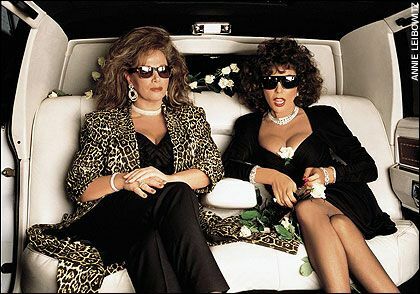 There’s Jackie Collins wearing her leopard power blazer in the limo with her sister, Dynasty actress Joan Collins. Looking back at these glamorous ambassadors reminds me that, truly, leopard print will never not be cool to wear. Zebra, snakeskin, and cow print are all camp-tastic, but nothing sings quite like leopard. Walking down the street, I’m one of many gals wearing a faux-fur leopard coat, and I admittedly fear becoming…basic. But to entertain that fear for long feels traitorous to the look that, when I first wore it, felt like the most me-thing ever. When I was discovering my tastes in my early twenties and becoming my best, tackiest self, a dramatic leopard scarf was one of the pieces that transitioned my look from whatever post-boho vibe I was giving off to the Miss Piggy aesthetic I adhere to now. In this era of reembracing camp, leopard still serves as an excellent no-thank-you to minimalism. Wear it as you will—if there’s any print that should be individually styled, it’s leopard—but might I suggest going all out with it. A lot of stylists will suggest subtlety—not accidentally going overboard with it and becoming a Halloween costume. I say, wear a Halloween costume! Pair it with hot pink and neon green or dripping in gold jewelry. If there’s any excuse to not be quiet, it’s wearing leopard.